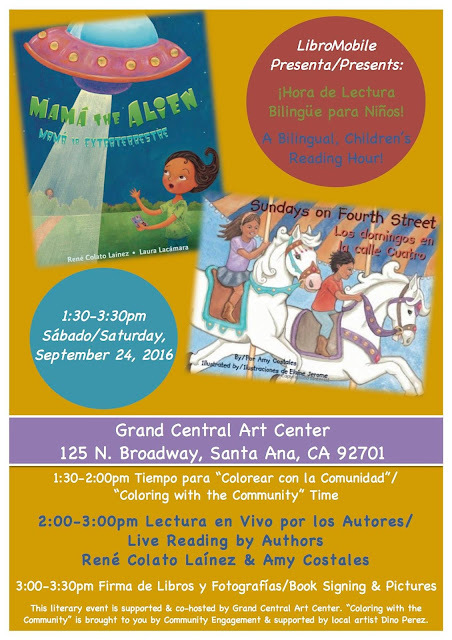 La Bloga: LibroMobile Presents: A Bilingual Children's Reading Hour! LibroMobile Presents: A Bilingual Children's Reading Hour! This literary event is supported & co-hosted by Grand Central Art Center. “Coloring with the Community” is brought to you by Community Engagement (communityengagement.org) & supported by local artist Dino Perez. I am René Colato Laínez, the Salvadoran award winning author of many bilingual/ multicultural children's books. I have a master's degree from Vermont College of Fine Arts in Writing for Children & Young Adults. My goal as a writer is to produce good multicultural children's literature; stories where minority children are portrayed in a positive way, where they can see themselves as heroes, and where they can dream and have hopes for the future. I want to write authentic stories of Latin American children living in the United States. I heard my first words of Spanish on my grandfather's lap. The son of a Sicilian immigrant and a Spanish/Cuban who was exiled when the U.S invaded Cuba in 1898, he spoke Spanish, English and Italian. When I was in my teens, my family unexpectedly move to California along the Mexican border. By then, I indentified as Spanish. I married a young Mexican immigrant, and soon had a daughter. I left him, but never the Mexican community to which he introduced me. Since then, I have taught bilingual third grade, fifth grade, Spanish, Social Studies, and ELD. I have taught in public school in California and Oregon and in international schools in India and Thailand. I currently teach Spanish and Spanish for Heritage Speakers at the University of Oregon where I am also an advisor to the Spanish Heritage Language program. An aspect I particularly love about teaching is inviting my students to write about their stories, their families, and their dreams. I have always loved writing. Raising my daughter, who is now a grown woman, inspired me to write picture books. The lives of all children need to be legitimized, not just to themselves, but to all children. Therefore Latino kids do not need to read books about Latino kids. All kids need to read books about Latino kids. And Latino kids need to read books about all kind of kids. Children will better understand the complexity of the country and the world if they are exposed to it.